“As for me, I am rather often uneasy in my mind, because I think that my life has not been calm enough; all those bitter disappointments, adversities, changes keep me from developing fully and naturally in my artistic career.” –Vincent van Gogh. Beauty is relative sometimes. What one person thinks is a visage of heaven is another person’s 2nd grade art project. People in general have different taste, and that fact is a pretty accepted fact. However, a very popular opinion, when concerning art, is that Vincent van Gogh is one of the greatest artists of the post-impressionist era. His work is in museums around the world, appearing mostly in the van Gogh Museum in Amsterdam, where a good portion of his artwork is on display. Van Gogh’s style, emotion and technique are greatly admired, studied and used as a judge for all other impressionistic works henceforth. His paintings are absolutely priceless in the art world. Even though van Gogh is incredibly famous in this time, when van Gogh was alive he was thought to be mentally ill and was not appreciated until after his suicide in 1890. If you do not know, Vincent van Gogh was born on March 30, 1853 in Groot-Zundert, Netherlands. He was the oldest son of Theodorus van Gogh and Anna Cornelia Carbentus. At age 15, his family was struggling financially and he was forced to leave school. After some shifting and traveling around, van Gogh taught and preached. His hope was to become a minister, but the evangelical committees were not on board. In 1880, van Gogh began taking art lessons. This began his love for art. On top of extensive research and tests given by the world’s leading experts in the art world, a letter that Van Gogh had written to his brother describing the painting also supported the accreditation of this work. It has been said that a discovery of this magnitude has never occurred in the history of the Van Gogh Museum. Starting September 24th, it will appear on exhibition in the Van Gogh Museum in Amsterdam for the world to see. To put it into perspective the worth of this discovery, three of van Gogh’s most popular paintings succeed each other in price. 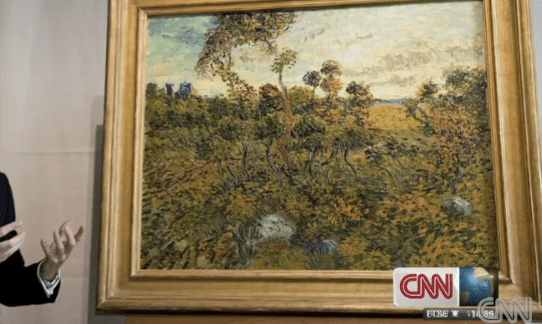 “Sunflowers” sold for $39.9 million, “Irises” for $53.9 million and “Portrait of Dr. Gachet” for $82.5 million. This most recent unearthing has left experts refusing to discuss dollar worth; however, it is agreed upon that this painting is priceless. So it is without any further delay, the world welcomes this new addition of art and culture into its history books.